View More In Event & Party Supplies. 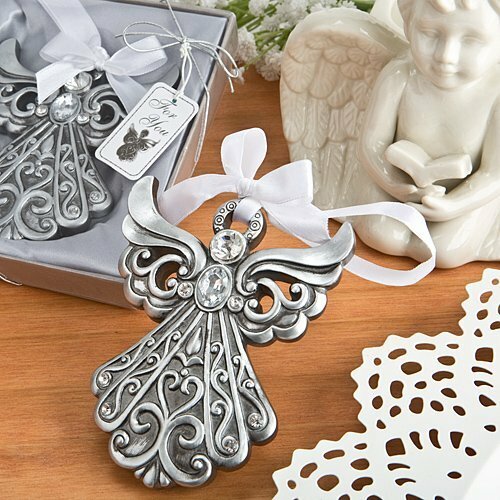 Angels are God's messengers and what better way to bring love and joy to your next event than with a stunning angel ornament from our premium collection! Offer your guests a delightful treat at your next religious occasion when they find these heavenly beings waiting on their tables. Made from poly resin with an antique silver finish, the angels feature a raised sculptured scroll design on the body with large ornate wings. The face is a clear round rhinestone and a second oval rhinestone adorns the chest. A beautifully engraved halo on the head attaches to a soft white satin ribbon that can be used to hang the angel in a special place. This magnificent favor is ideal for christenings, baptisms, communions and other religious events. They are also perfect to bring love and joy to winter weddings! Angel size is 4" x 3 1/4"
A perfect favor for christenings, baptisms, communions and all religious events! If you have any questions about this product by Fashioncraft, contact us by completing and submitting the form below. If you are looking for a specif part number, please include it with your message.